Last week I did the unthinkable. . . I LOST a piece of jewelry. As soon as I realized that I couldn't find the darn thing, I knew it was time to do some serious organizing. I started by making sure that the pieces I had listed in my shop were on my "wall of listed items." 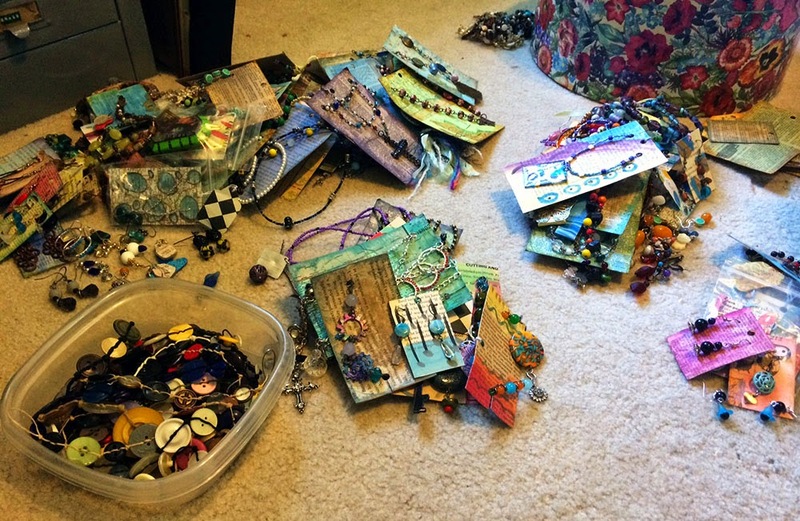 Once that was done, I sorted all the rest of my jewelry into piles. and piles of jewelry to be donated to Goodwill. 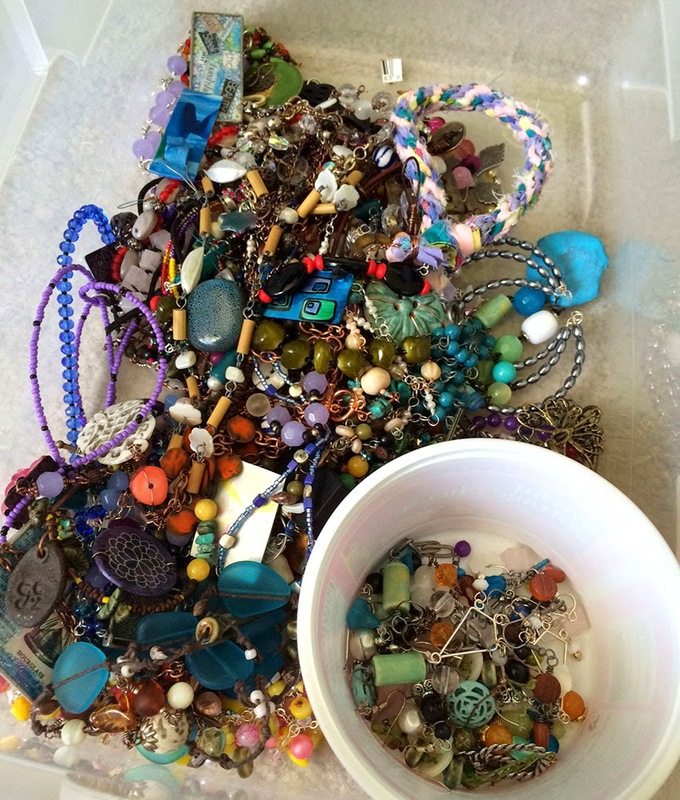 Each of those piles were divided into subcategories (earrings, bracelets, necklaces, etc.). It was a mess of piles. (I also double checked my digital files to make sure that they matched the floor-sorting.) It was a most-of-the-day process. By the end of the day, I had a small tub full of jewelry 'to be trashed.' These are the pieces that I just don't think work or just don't like for one reason or another. The tub almost sends me into tears because of the countless HOURS of work I put into the pieces piled in it. However, I know that taking them apart will give the components a new life, new possibilities and that's a good thing. Right!? At some point I'll actually begin the painstaking process of tearing those pieces apart, but for now I'm just glad to know that everything is where it's supposed to be. 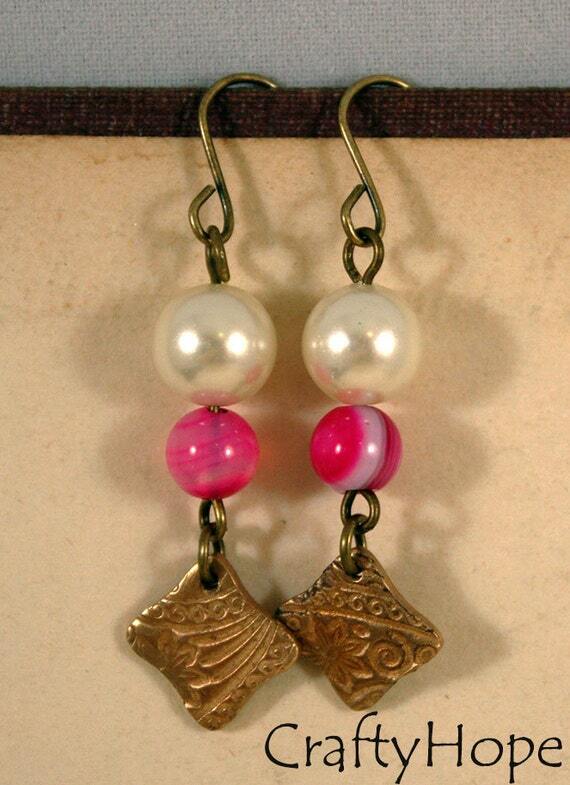 It makes finding items so much easier, including these pretty little earrings that were relisted today. 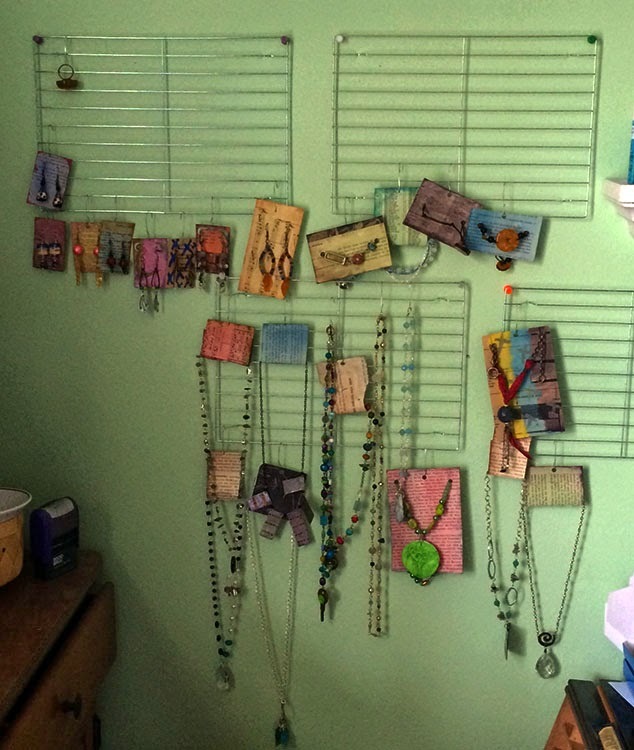 How do you keep all your jewelry organized? I have my grandmother's jewelry cabinet. Heather- That's perfect for everyday jewelry! All the jewelry I wear is hanging in the bathroom and stuffed in little jewelry drawers. As I'm making jewellery for about an year, I don't have much to organise. I put each piece in a plastic bag labelled with a number and I have a notebook where I record everything I make. It must difficult to tear pieces apart because of the inumerous amount of hours you have spent but the same hours are your own knowledge and experience so you are richer. Well, I don' t make jewelry, so I don't have nearly as much as you, but I use one of those little wire trees that was made to hold Christmas cards on the tips. It gets tangled sometimes, so I guess I need to find a better solution. Organizing is a daunting task, but you will feel so fabulous and smart when you get through! Good luck!! Did you ever find the lost piece of jewelry you were looking for? Yes! New life for all those beads is the way to go! Just think, once they're all taken apart you'll have a bunch of "new" beads to work with! I know how depressing it can be to look back and think about how much time went into something that I no longer like, but hey! if we looked back at everything we ever made and loved it, we would probably get bored and stop creating! I'm always driven by wanting to improve and expand—trying new things is so much fun! These days I've been keeping all the new jewelry I make for myself (most of what I making lately is for challenges and I often don't want to part with them when I finish) and right now they're all stored in little plastic sandwich bags in a box—so very artistic, I know!